Yep, its trout, Rainbows that is brought to us special from the Willow Beach Hatchery. We are getting some great fish this year. Our federal hatchery is providing all anglers in this area with some nice trout. Our visiting angler John Beigh from Ohio stopped in to share his catch. John was fishing from shore in the Rotary park area using a Kastmaster. This spinner also has been producing a few of our smaller stripped bass. It seems the stripers like the little shinning thing as well as the trout do. I have been getting reports that rooster tails were also doing well from bringing in the trout. For you bait anglers night crawlers and power bait is always a good choice then again you do have to mix it up a bit to find out what is working the best. I did hear of some striper action and anchovies were doing well. 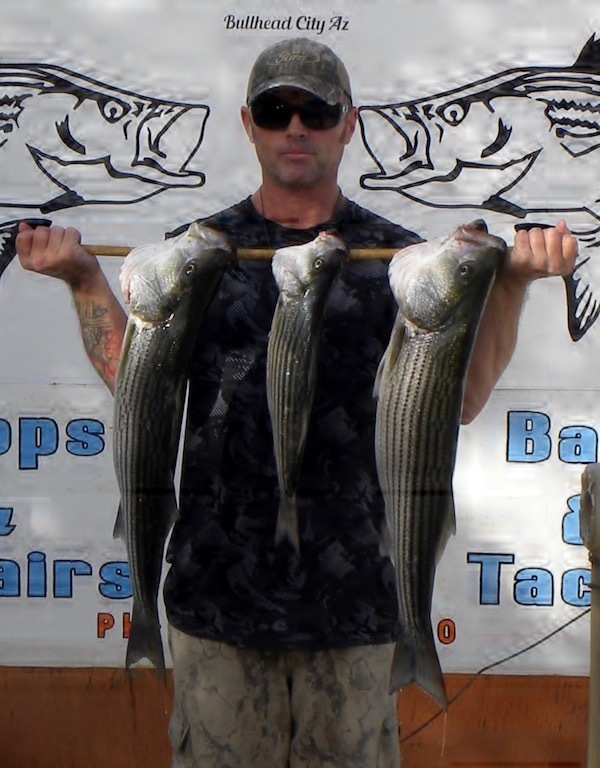 Lake Mohave: The Lake is Starting to Produce Some Stripers.